Somehow today’s dress is one of those dresses I finish and never want to see again. It’s certainly all those ruffles. Even I have my limits, you know. 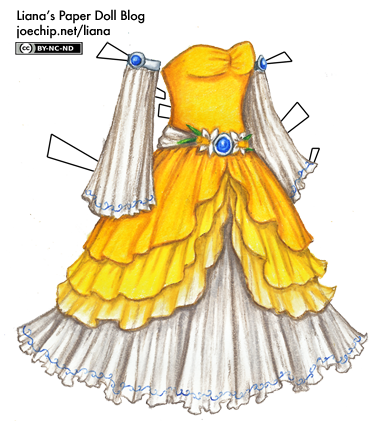 Anyways, this is the birthday dress for March — happy belated birthday, March babies, and I’m sorry about how late it is. The birth flower is the daffodil, and the birth stone is aquamarine, both of which I botched but hey, it is colorful at least. It is more of a dress to wear in the lamb portion of March; from the comfortable vantage point of May, I forget that this dress might be a little cold for Ivy’s shoulders and ankles. Question: How many Prismacolor pencils do I own as of May 18th? 1) It’s a new year, so even if you’ve already won one, feel free to guess again. Very pretty! I love the yellow. P.S. I loved the peacock dress from yesterday. splendid colors!!!!!!! I love this dress, although it’s a little too yellow for me. I reallllllly want to winn!!! OMG we posted at the same time! 1873 i love this dress!! Liana you’re so talented!! I never liked guessing though, I’ve been always bad at it. I hope that in September it’s as cute as this one.. well, my guess is 853. It’s a pretty big number, eh? Perhaps 812 Prismacolors? Love the trailing blue design on the edges of the sleeves and skirt! I don’t know why you don’t want to see it anymore- I really like it! It’s really cheerful and bright, especially for March, and although my birthday isn’t in March, I would definitely wear it! Hmmm, let’s see…yesterday I guessed 615, so today I’ll do 530. OMG my birthday is in march and I love this dress! I’m gonna go with ummmmmm 432. I hope I win! I swear I just guessed on a different post, but I’ll guess here too. 482.
i love this dress!!!! I hope next year you can do a February dress!!! Do you think that you could make a late February dress????? Please please!!! Could you do a really gorgeous one for december?